Problem finding a reliable consultant? We have been continously helping many people all over the world in doing numerous off-site consultations to review the layout plans for their dream house. Our clients are across all continents and diverse. Many of our clients are located in the United States, Europe & Asia. And we can certainly do the same worry free audit for you! What you get for this audit? You get your layout plans are reviewed personally by Master Cecil Lee. Who will not only analyze your layout plans but ensure that it fits you and your family members. Master Cecil Lee will employ all the well known Feng Shui techniques and tools especially to look out for potential threats and work around them. In addition, the purpose of the audit is also to enhance beneficial Qi for your home. He will be personally working with you throughout the layout plans until you are fully satisfied and all your questions are answered. As mentioned above, Master Cecil Lee is well known for being very thorough in his audit and he will give you the same care and attention for your audit like he does for his local audit. Are you short-changed by your Geomancer? Proposed Layout Plan of the house (with the North direction compass on the layout plan). This is often available in the sales brochure or by taking a reading on the piece of land. Pictures or Photos of your site and surrounding (if possible). How do I sent the information to you? What type of graphic format can I sent you? Do you accept the layout in AutoCAD files? Yes! We use a wide variety of software and since AutoCAD is popular, we can work on you layout plan using AutoCAD or any other popular layout software files. If you need to confirm, do let us know. I am really anxious about my new house. How fast can you get back to me on my home layout? Master Cecil Lee will often get back to you on the proposed layout plan within 2 to 3 working days or earlier for urgent review or within 14 days for non-urgent review. Part I - Site Assessment. How suitable is the house to the breadwinner and other crucial suggestions and recommendations. Part 2 - Ground Floor plans. Here the main entrance door, the kitchen, toilets, living room and all other rooms are looked at closely with recommendations for any changes to the layout plans. Part 3 -First Floor plans (e.g. living quarters) with detailed analysis and proposed layout changes (if any). Plus recommendations on which family member should sleep in which room. And the layout of the bed / toilets and other pointers to note). Part 4 - Attend to and analyze the specific requests such as the position of the family swimming pool and landscaping. The above is just a small fraction of what you can expect from our personalized off-site audit. Do you provide auspicious dates for start of renovations and moving-in? Yes! The selection of auspicious dates for start of renovations and moving-in comes standard with this worry free package. After the audit, can I seek further clarifications on this audit? Yes! We are committed to after-sales service. And feel free to contact Cecil Lee for any other clarifications or queries at any time after the audit! Which comes first? The Feng Shui Audit or the Architect's/Interior Decorator's recommendations? For a new house, it is best that we go thru the Feng Shui Audit with you before you ask your interior decorator for a proposed design. You can get your architect to provide you a proposed layout. We can work with you to re-fine the layout plan. 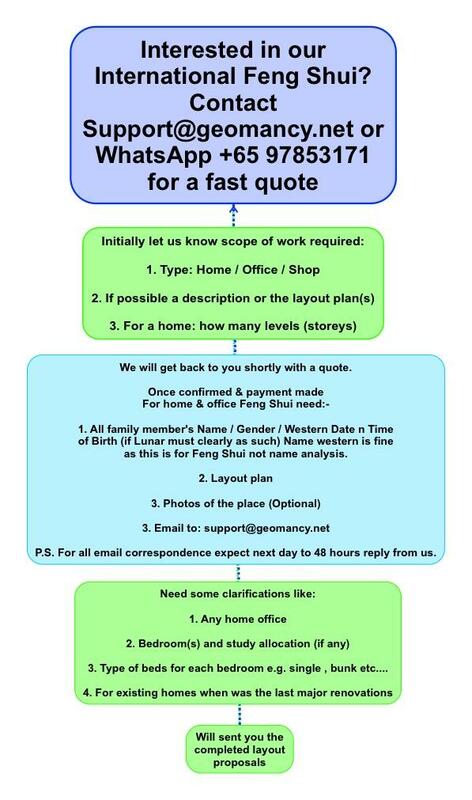 Once the final layout plan has been confirmed, Cecil Lee will inform you each family member's Ba Zi and the beneficial binding element of both partners in relation to the Feng Shui audit. You will also know each family member's favorable/unfavorable elements and each family member's wealth element. We will also review your house birth chart and room-by-room. Any questions that you have e.g. the color scheme, the material and even the layout for each room will be looked at together with him in detail. Are there any hidden costs in your audit? No. Again we must emphases that our prices are affordable and FIXED PRICING i.e. no additional costs involved. We have a reputation to maintain and will continue to do so. Does good Feng Shui audits have to be expensive? No! We feel that good quality audits for your home need not be expensive! And as a consumer, we want to ensure that you do get the best value for your hard earned money. As you can see our on-site audits are reasonably priced and value for money! Will you let me know the auspicious and time for start of renovations and moving in? Yes. This comes standard with our on-site audit. Master Cecil Lee will provide you dates for both the start of renovations and the moving in. If there is any delay in moving in, you can further request him to select new dates for you. Simply call him up! I have some unanswered questions about your audit?